Adwords is Google’s advertising platform that allows business to advertise on google searches, YouTube videos., etc.. Basically where Google gets most of it’s billions from. Adwords allows you to advertise in any specified location either Princeton, NJ or Globally. 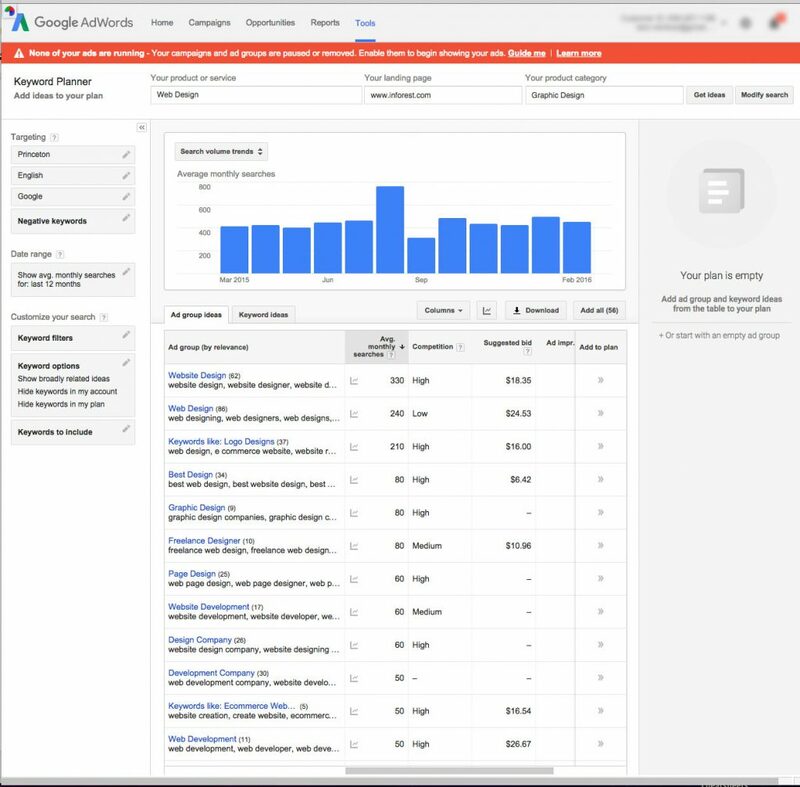 Signing up for Google AdWords is free. You only pay when someone clicks your ad to visit your website, or calls you. Google made major changes to AdWords, removing right-column ads entirely and rolling out 4-ad top blocks on many commercial searches. While this was a paid search update, it had significant implications for Click Through Rate (the percentage of people who click your ad) for both paid and organic results, especially on competitive keywords. Is an amazing (FREE) tool from google that helps you choose your keywords. It lets you know how many monthly searches, what the competition for the keyword is, and what the suggested bid is. Just keep in mind it was created for Adwords so unless you are doing an Adwords campaign not all the information will be useful to you. For example, when we first started “Keyword Advertising” we advertised for Web Development because we do coding and design. After some trial and error we realised that although we are “Web Developers” the keywords that were being searched for was “Web Design” and “Web Designers”. How much is a click-thru worth for “Website Design” in Princeton, NJ? Leon is primary lead for Inforest Communications graphic and Web design services. He has over ten years experience in Web design and development and is proficient working with open­source CMS systems. He holds an associates degree in Computer Graphics from Mercer County Community College. Leon Rainbow is also a well known artist in Mercer County who creatively combines graffiti, street art and other artistic forms into innovative projects and events. He reaches out to wide audience, from galleries to the walls of inner cities. Leon curates two annual art festivals in New Jersey for area painters and the community as well as dedicating his civic duty to teaching after­school art programs in Trenton and Princeton, NJ. Inforest Communications is a Web design and development company based in Princeton, New Jersey. Why is my E-Commerce store not getting traffic?